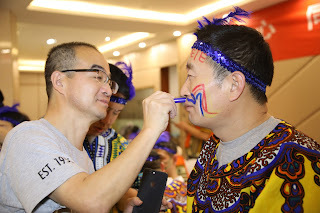 On January 12, 2018 LATICRETE China hosted the ONE LATICRETE ONE TEAM event during the day for over 200 employees followed by their 10th Anniversary celebration later that night. 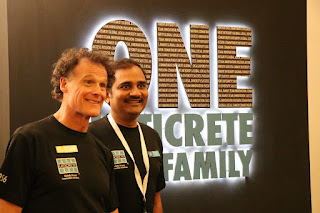 This new initiative started in 2018 brings David and Henry Rothberg, 2nd generation LATICRETE to the employees of each of our global business units to talk about the history, success, culture and future growth plans of the company. 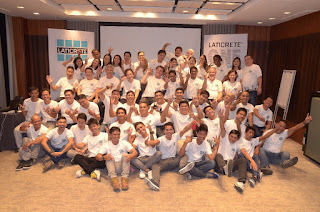 LATICRETE, despite geographical distance, is ‘one’ team with the same vision, mission and values. The event for our team in China kicked off with inspirational speeches from Bill Qiu, GM of LATICRETE China, David Rothberg, Chairman / CEO, LATICRETE International and Erno de Bruijn, LATICRETE President and COO, International Division. Jenny Fu, Management Trainee, acted as translator to assist with conveying David’s message to the team. “I am very proud to be celebrating our 10th anniversary in China! In 10 years we became one of the driving forces behind the national standard setting for tile and stone installations, we became one of the leading brands in the industry and our material were used on many of the landmark construction projects. 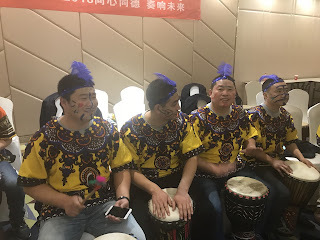 After the speeches the group split into teams to learn how to play the African drum and later competed for the opportunity to perform at that night’s 10th Anniversary celebration. The team building session was divided into 3 parts: concentric, synchronization and inspiration. The groups learned about the drum and practiced using a combination of their body and the drum to develop the beat and rhythm into a song. Next the coaches came on stage helping the teams bring into synchronization with one another. Finally, the teams competed against one another in a drumming competition! During the exercise the teams learned how to interact with one another enhancing each other’s strengths and creating positive energy throughout the entire experience. 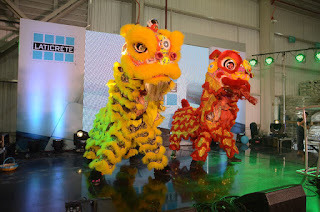 We were honored to include employees, customers, several former employees, LATICRETE China Board Members, and international guests from LATICRETE headquarters and other LATICRETE international business units from around the globe in the anniversary celebration. We were honored to award 7 of our suppliers with a “Supplier of the Year Award”! 1. Jiangsu Gude Plastics Co., Ltd.
2. Shanghai Yinge Industrial Co., Ltd.
3. Tianpu Chemicals Co., Ltd.
4. Changsha Meilin Building Materials Co., Ltd.
5. Shanghai Miaogu Industrial Co., Ltd.
6. Pinghu Shengzhu Packing Co., Ltd.
7. 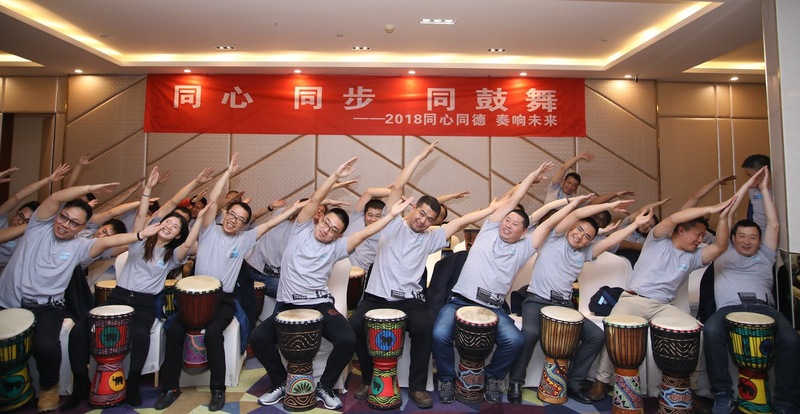 Shanghai Leixia Industrial Co., Ltd.
Attendees were entertained by 11 different teams giving performances which included singing, dancing, acting and reciting poems! 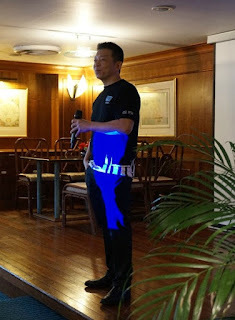 Everyone had the opportunity to win gifts during the “Luck Draw” game using a QR code in WeChat. It was a great day and night of celebrating the accomplishments of our team and our partners who help make us successful. On January 14, 2018 over 85 LATICRETE team members from the Middle East and Africa got together to participate in the ONE LATICRETE ONE TEAM event held at Rixos Bab Al Bahr, Ras Al Khaimah, United Arab Emirates. 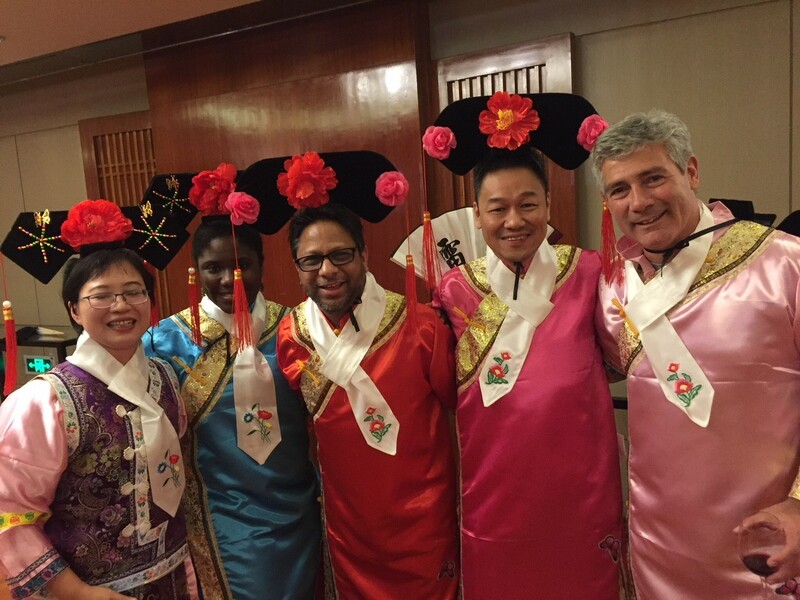 David Rothberg, Chairman/CEO of LATICRETE International arrived and was met by a special team of Kandura performers, dressed in the local attire dancing to the tunes of a traditional Emirati song, in true form of a customary Emirati welcome. The event kicked off with Ritesh Singh, General Manager, LATICRETE Middle East, sharing a video presentation of the journey and history of how LATICRETE started off in Dubai and grew as a successful business enterprise across the Middle East and Africa, while highlighting several iconic projects that the team has been a part of. 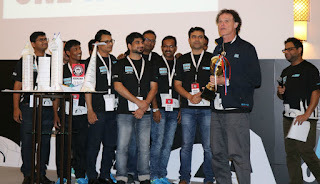 A highlight of the day was another video that Mr. Singh shared with the group of all the employees coming together chiming in with the phrase One LATICRETE One Family, in their own unique way and in different languages conveying the importance of the theme of the event, “ONE LATICRETE ONE TEAM”. Mr. Rothberg spoke to the group (with the help of Faisal Saleem, VP LATICRETE International, translating into Hindi) the journey of LATICRETE throughout the past 61 years into a truly global company. – David Rothberg, Chairman/CEO of LATICRETE International, Inc. Team building fun was next on the agenda! Eight teams formed to take part in “Chinese Whispers”, “The Perfect Square” and “Build a Building” activities. A twist on the “Chinese Whispers”, or “telephone” game adopted where instead of whispering messages to their neighbor, they used actions instead. This made it a ton of fun for all playing and observing the game! The objective was to understand the implications of one’s actions and the need to listen attentively. 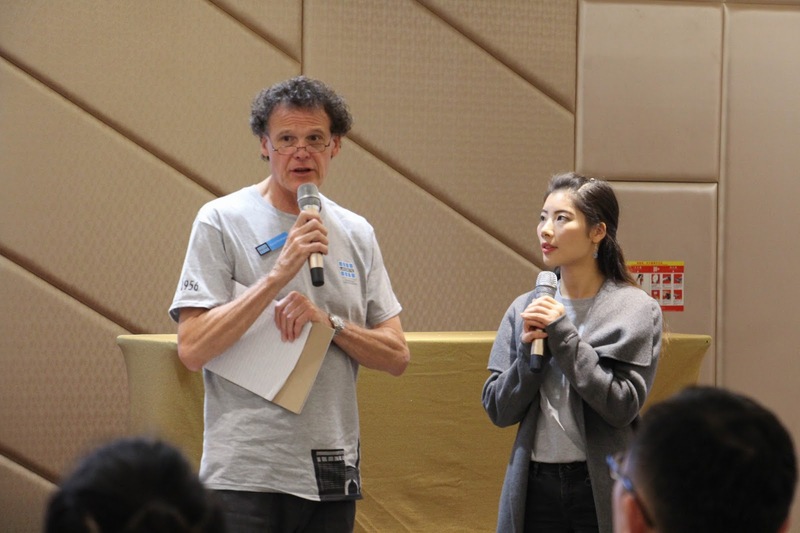 It reminded the participants, just how quickly a message can be changed into something completely different when it is passed between even a few people. It educated the team to be mindful of what information is spread, given the fact that what is said or done, can have a negative impact on the individual or business that is being talked about. The second activity, “The Perfect Square” each team stood in a circle and blindfold themselves. The objective was to form a large, perfect square with the rope, using its entire length. When the team had reached a consensus that they have formed the square, they call out “Perfect Square” and the results were inspected. The objective was for team participants to realize the importance of being able to get a clear mental image of the end result. It also demonstrated how empowering one’s teammates, contributed to goal attainment. Being blindfolded, the key was communication and the ability to work together as a team to achieve a favorable result. The third activity, “Build a Building” each team was given the same set of tools, flipchart, foam board, masking tape, tennis ball and markers, to build a building. Using these tools, the teams had to first draw out and then construct a freestanding structure that had to be transported to the stage without falling apart. They then presented their project with a solid marketing plan to prove that their development was the best. 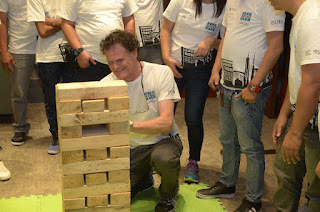 The objective of the game was to understand strategy, planning a project, managing resources and collaborating to achieve a common goal, under the pressure of a tight timeframe. Congrats to the winners, SUPERCAPTAINS, for their innovative idea, construction, teamwork and collaboration, marketing and presentation of their overall concept. We love that our team members are enjoying these events! 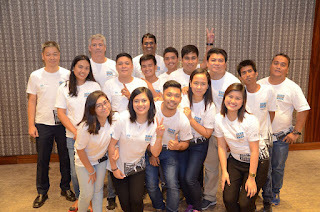 Big things were happening with our LATICRETE Philippines team last week! 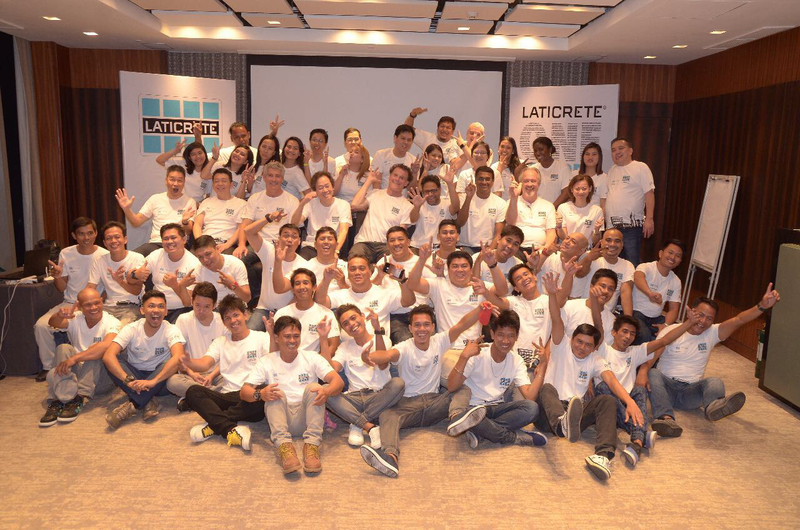 On January 10, 2018 they celebrated both the inauguration of the LATICRETE Philippines Plant as well as our ONE LATICRETE ONE TEAM initiative! 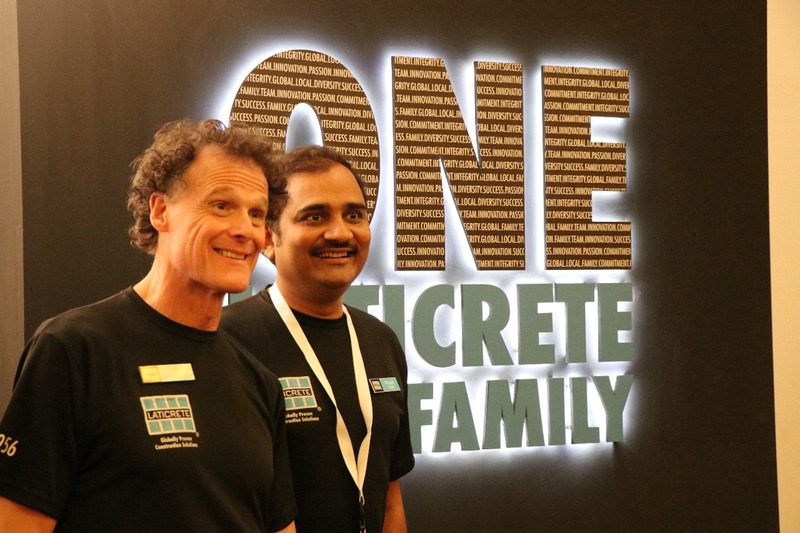 David Rothberg, Chairman / CEO, Faisal Saleem, Vice President, Erno De Brujin, President / COO, guests from LATICRETE business units in India, Singapore, Malaysia and the United States as well as our team from the Philippines spent the day celebrating the milestones of LATICRETE Philippines. 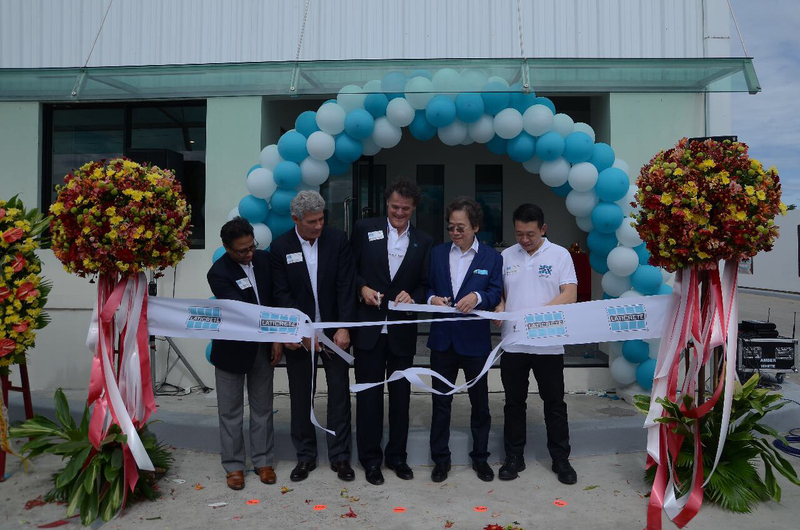 During the plant inauguration, opening remarks were given by Mr. Ruben Ong, President LATICRETE Philippines, followed by speeches by Faisal Saleem, Erno De Brujin and David Rothberg. A ceremonial toast with Mr. Ong, Mr. Saleem, Mr. De Brujin and Mr. Rothberg was held followed by the ribbon cutting, blessing and coin tossing. Later that evening the team got together for the ONE LATICRETE ONE TEAM event. 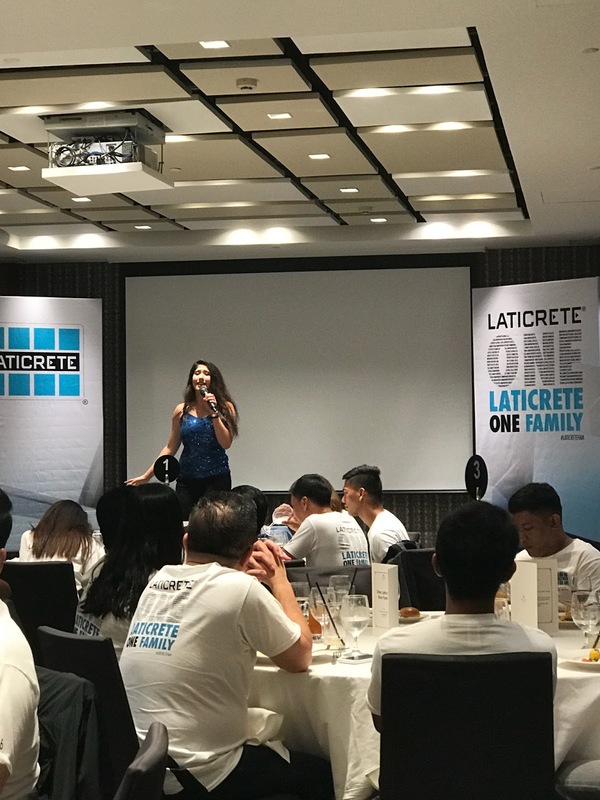 This initiative, which is traveling to all of the LATICRETE business units throughout the globe this year, allows employees to learn about the history of the company, culture and future growth plans of LATICRETE. LATICRETE executives spoke to the group about the importance of our entire LATICRETE team in all of our business units working together for "One Dream, Together as a Team". Mr. Ong left them with this message, "When the going gets tough, the tough gets going" quoted by Joseph Kennedy. 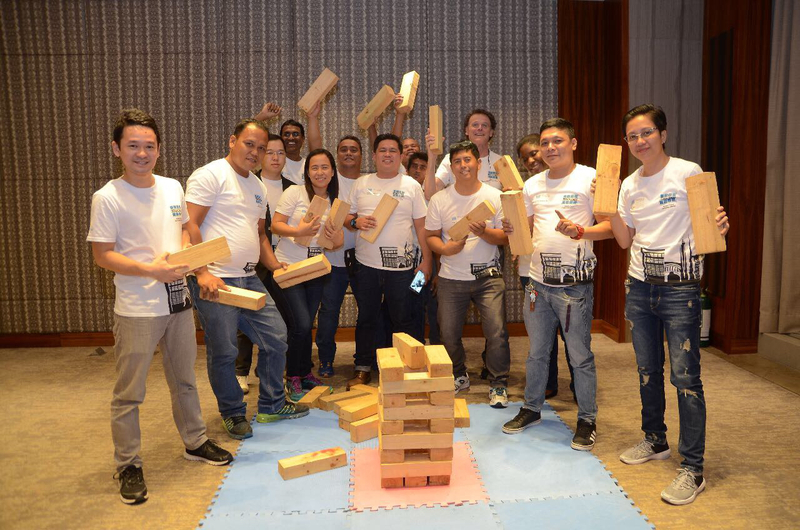 Over 50 of our team members engaged in several team building activities including giant Jenga and Minefield. In the strategy game of Minefield, the objective is to get as many members across the obstacle course as possible. One member is blindfolded while the rest team gives them directions to pass through the course without stepping on a single obstacle. If they step on an obstacle, he or she sits out, and the next member goes. Whichever team gets the most players through the course within the time 10-minute time limit, wins. It was a great time by all including the winning team shown below. They enjoyed the rest of the evening emceed by 2013 Miss World Philippines and 2nd Princess Ms. Zahra Saldua. Several team members performed a dance routine with songs from a 1990's mix and "DAHIL SAYO" by Inigo Pascual which means "Because of you". 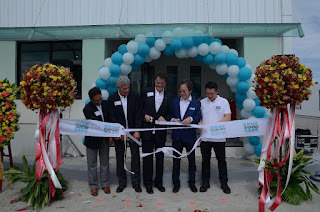 Thank you to everyone who attended our plant inauguration and team event! Stay tuned later this week for coverage of events in both China and Middle East / Africa. As we shared earlier this week, throughout the year David and Henry Rothberg, 2nd generation LATICRETE will be visiting with the employees of each of our global business units to talk about the history, success, culture and future growth plans of the company. This week David headed to Singapore for the second stop in the new global initiative ONE LATICRETE ONE TEAM with over 50 LATICRETE South East Asia (LSEA) and Malaysia team members. 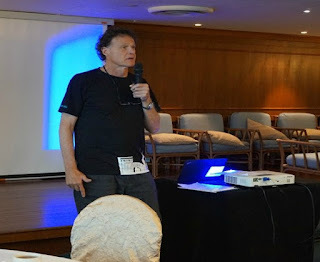 He was honored to be back in one of LATICRETE’s oldest overseas locations (Singapore) and also glad to join the newest LATICRETE business team, Malaysia for this event. David Rothberg spoke of the importance of writing down your goals on a piece of paper and giving it to someone who will hold you accountable. If not it will just only be a dream. 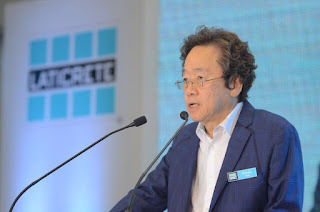 He reinforced that each employee is an integral component of the growth of LATICRETE and that with One Team, One Family and Together we will be successful. Mr. Raymond See, Managing Director, LATICRETE South East Asia Pte Ltd discussed the importance of teamwork and reinforced David's advice to dream big - 2018 is a new year with a new set of goals. Together, we can accomplish our objective. "One Dream, together as a Team." Five groups to learn how to play the ukulele as part of a team building activity. 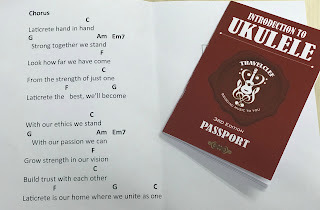 They learned how to play 5 songs as well as the ‘One LATICRETE One Team song that was previously written by LATICRETE South East Asia team. During the exercise they were taught the importance of communication, teamwork and forward planning. Each team then performed the songs they had learned. The winning team was selected by the TravelClef (traveling music school). At the end of the day the entire team got together to perform the LATICRETE song! We look forward to sharing the visits to our other global locations throughout the year! We’re happy to announce a new initiative for 2018 called, ONE LATICRETE ONE TEAM. 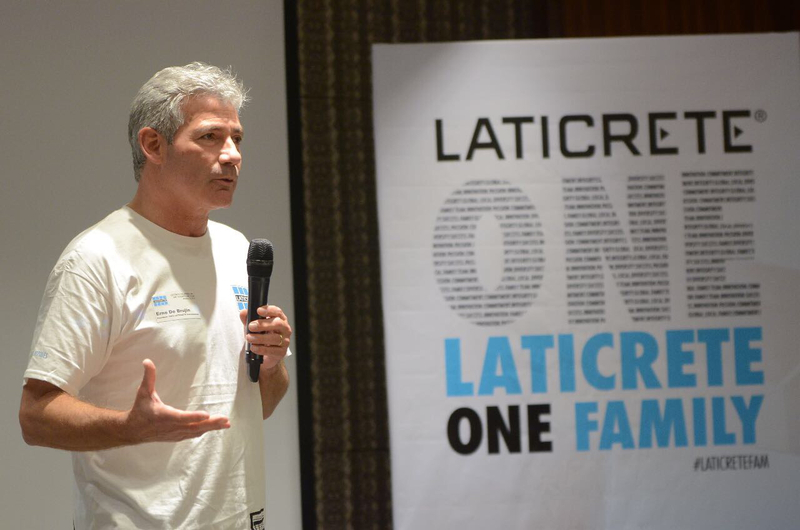 Throughout the year David and Henry Rothberg, 2nd generation LATICRETE will be visiting with the employees of each of our global business units to talk about the history, success, culture and future growth plans of the company. 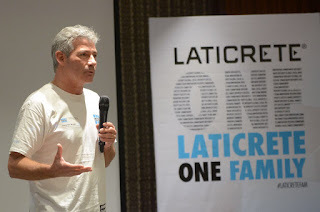 LATICRETE, despite geographical distance, is ‘one’ team with the same vision, mission and values. 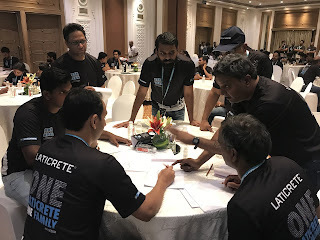 Last week in Hyderabad, India, the MYK LATCRETE team was the first of our global family to participate in the initiative. 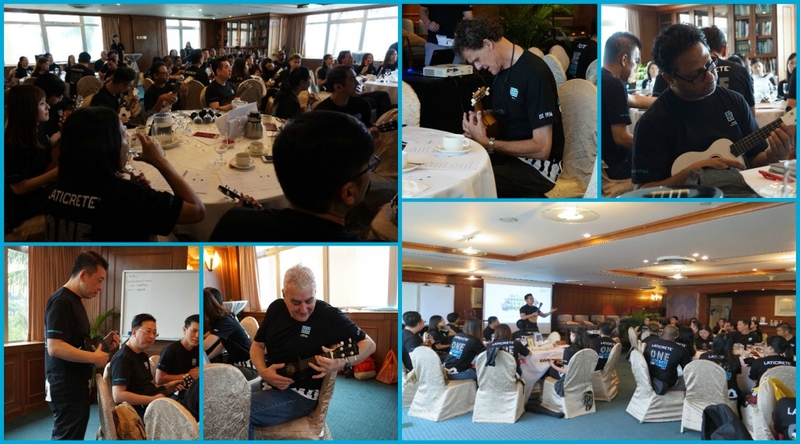 To get things started, the team was broken into 4 groups (named: SpectraLOCK, SP-100, Stellar and HYDRO BAN) to participate in some team building activities which included ‘centipede’, ‘jailbreak’, and ‘Made in India’. During these activities the group worked on communication skills, collaboration and the importance of team. Afterwards David Rothberg, Chairman/CEO LATICRETE International, Inc. and Muralidhar Yadama, Managing Director, MYK LATICRETE addressed the team touching upon the humble beginnings of LATICRETE, the growth we have experienced in the last 60 plus years and our aggressive growth plans for the future (both globally and locally within India). 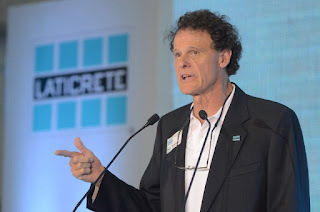 David A. Rothberg, Chairman/CEO LATICRETE International, Inc.
• "MYK LATICRETE had a humble beginning. 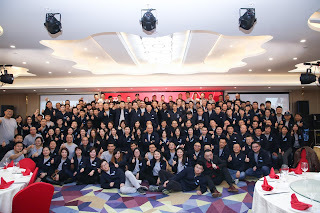 Today we are 500 employees with 3 factories and 25 branches. Most importantly we are the # 1 company in India!" • "It’s the team work and passion that drives us. Our values are important to us and are the foundation of our success." They each highlighted that each employee is an integral component of the company’s growth and that with One Team, One Family and Together we will be successful. They concluded with a great team lunch.